Good condition for a re-manufacturer! Better than refurb. It looks new and everything worked and functions the same. Unbelievable! This thing is almost as good as new. All the filters are brand new. It smells like new. A few little things here and there that are cosmetic damage that's all. I couldn't believe how much dust and dirt it pulled out if my carpet. It grooms your carpet nicely. I Highly recommend buying refurbished goods from this company. pretty powerful vacuum, but emmited terrible smell. This vacuum cleaned well, but I returned it due to a plastic/chemical smell that was emitted when it ran. I believe it was the filter. I used it twice and got lightheaded both times. The vacuum was also a bit tough to handle as well. The roller clogged up with dog hair both times I used it. 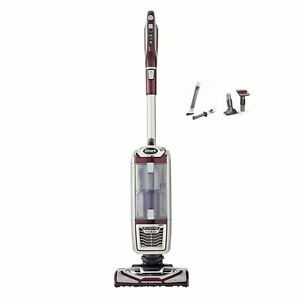 Overall a decent vacuum, but it has some flaws. I have had a compact that rolls around on 3 wheels since 1968. I wore it out. I did not know what I was missing until I got the Shark rotator Powered lift away. The powered brush roller is super. Machine has great suction and the lift away pod is so handy to use. This vacuum does the work. All you have to do is keep up with it. Get one of these and you will not be disappointed. quiet - powerful - neat .Very glad we got this vacuum. The vacuum looks and works perfectly. It was here even faster than stated when I bought it. All the extra features like the light in the handle not just the power head is nice when getting those under and behind areas like the pantry. It has plenty of power and is a lot quieter than our old vacuum. When we would pull out the other one cats would scatter, they sit and watch this one was we clean after they saw how much quieter it is than our old one.Very glad we got this vacuum.